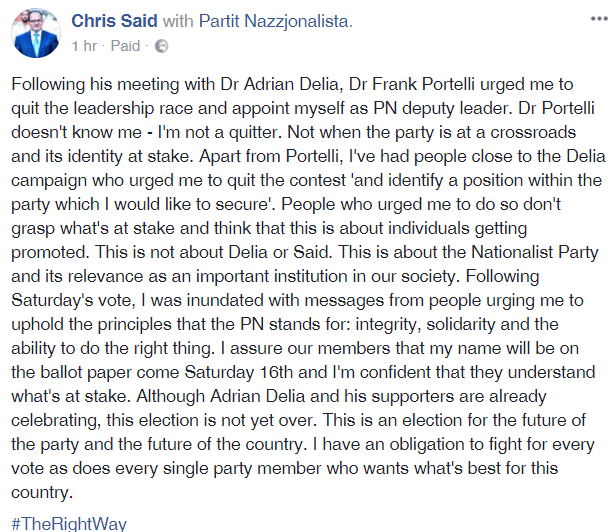 Nationalist Party leadership candidate Chris Said says that he would have no qualms about resigning his parliamentary seat and quitting politics if his fears about the PN becoming a "Labour Mark II" come to be. The Nadur lawyer has served under three PN leaders over two decades in politics and says he would be willing to work with a fourth should his leadership campaign come up short. But that willingness is not a blank cheque, he says in this Times Talk interview. "I've resigned before and I'll do it again," Dr Said says, referring to his 2010 decision to step aside as parliamentary secretary to clear his name of perjury charges. "That's what honour in politics demands." Dr Said was runner up in the first phase of the leadership election last Saturday, with Adrian Delia topping the poll by the party's councillors at 46%. The two face off on September 16, with all 22,000 party members eligible to vote. The winner needs a 50%+1 majority to win. In this Times Talk interview, Dr Said hammers home his concern that the PN is in danger of losing its identity. Without directly referencing Dr Delia, he says that the Labour Party has made it clear it would rather have his leadership rival in the Opposition hot seat. "God forbid we end up with a leader who can be blackmailed, or who is constantly on the back foot defending himself," he says. " The former mayor and minister admits he is the underdog in this leadership race, and says the roughly 20,000 party members who will vote must be mindful of the choice before them. "They're not choosing between Said and Delia," he says, "they're choosing where they want their party to head from September 17 onwards." Speaking at a press conference in Birkirkara this morning, Dr Said made it clear he would not bow out of the race to join forces with his rival Dr Delia. Doing so would be a "disservice" to PN members who had the right to make a choice, he said. The Gozitan MP was reacting to a call made by ousted leadership contestant Frank Portelli, who suggested Dr Said could strike a deal to become deputy leader and regional leader for Gozo. Asked about recent comments on Facebook which fueled controversy, including one by PN administrative council President Karol Aquilina who warned that the PN should not be taken over by freemasons, Dr Said pledged to introduce a social media code of conduct for officials if elected leader. Outlining his vision he said that the PN should be setting the agenda and not allow Labour or “journalists" to do it, through he stopped short of mentioning Daphne Caruana Galizia.